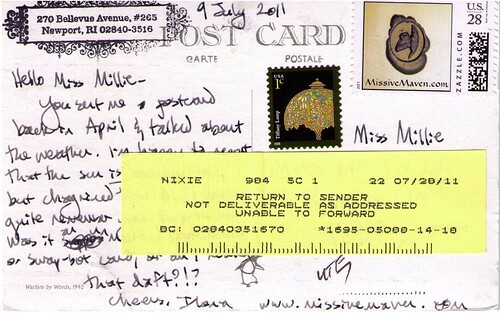 Someone signing herself "Miss Millie" sent me a postcard in April. She was one of the good ones who put a return address on her postcard, so I did send her a postcard back in July. But it was returned to me. I thought I copied her address exactly, but her handwriting was not the most... direct. So, if you are Miss Millie in the vicinity of Puyallup, WA (or were in that vicinity in April), do let me know the proper address and I'll try again. Miss Millie was a bit of a mystery even then, because she wrote to me with some sort of familiarity, but I had no idea who she was. Did we exchange on swap-bot? Postcrossing? Sendsomething.net? Another method? Because I really do get a lot of mail, and if we don't write regularly, I am likely to forget. C'est la vie. UPDATE: thanks to a kind and observant reader (thanks, Pen Thief! ), I've got an address (though not from Miss Millie herself). I misplaced one letter, which has me somewhat baffled, as I was under the impression - from postal workers - that it gets routed by the zip code, which was correct. Hmm. Anomalies happen. I'll pop it in an envelope and send it off again. I am still not sure where our correspondence began, but that could be due to my own rusty memory and slow response time! I believe "nixie" is the official term. Recently I did a crossword puzzle where nixie was the answer. I was ashamed of myself that I missed a postal based clue! Agreed, it is indeed official; it just means that the mailpiece is undeliverable as addressed. 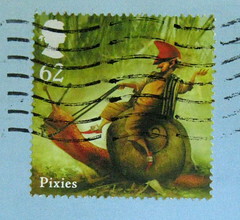 I think you'll find MissMillie on Postcrossing. I like Speck's "WTH???" I think that's what my recent returned mail is trying to tell me - it got sent to Germany at the end of January and came back to me last week. Must've gone all around the world.